"Ooo-ooo-ooo-ooo, ahh-ahh-ahh-ahh" We have Friday the 13th to thank (or blame) for a great many of the tropes that most commonly inform the average slasher movie as it's come to be known: One-dimensional teens being punished for letting their libidos get in the way of responsibility; a crazy old man warning of impending doom; a mysterious vengeance-minded murderer; gory surprise kills; a future star catching an early break (Kevin Bacon in this case). All have roots in the most iconic of horror franchises, even though the famous and highly merchandisable hockey mask and machete combo doesn't appear until the third entry in the twelve-film series. A direct response to the success of John Carpenter's Halloween, director/co-writer Sean S. Cunningham distilled elements of that film into something more viscerally focused that ostensibly implicates the viewer's bloodlust and lack of empathy for the onscreen victims. He achieves this through a killer's-eye-view shot—expanding Halloween's opening scene perspective into an essential gimmick—and a specific lack of character development, or history, which creates a sense of detachment. We don't learn anything distinct about the pack of horny young camp counsellors being picked off at Camp Crystal Lake—a place rumoured to be haunted ever since the drowning of a young boy years earlier. They are little more than unfortunate objects conveniently positioned to feed the killer's, and audience's, desires. Their crime is that of neglect. Were any of these dumb kids less preoccupied with pheromone sniffing and more aware of their surroundings, they would still be alive, as would the kid who drowned while his supervisors were getting pelvic. The message doesn't run much deeper than voyeuristic finger-pointing, and the kills, while still shocking, surprisingly, are marred by dated makeup effects. 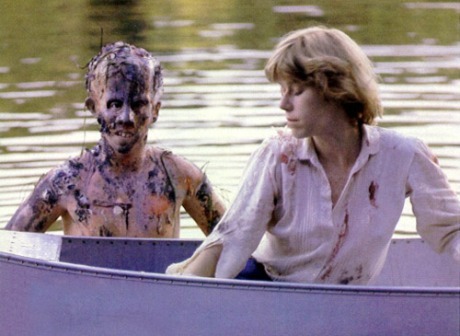 But the ways in which Cunningham effectively toyed with audience expectation and perspective still make this origin of Jason Voorhees stand out in the pantheon of horror cinema.